Porsches have never been inexpensive – but they’re about to become more so. You could call it the electric surtax – because that’s what it amounts to. And it’s probably going to be applied to us all, eventually. 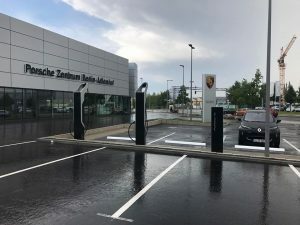 Porsche corporate – the company – just announced that it will expect all 190 of its U.S. stores to install high-voltage fast chargers at a cost of $300,000-$400,000 per store as part of the company’s “commitment” to “electrify” half its product portfolio by 2025. 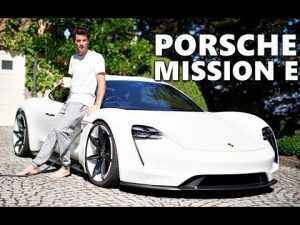 The problem – which Porsche openly concedes – is that while electric Porsches are fast, they’re slower than a ’72 Pinto with a slipping transmission when it comes to recharging. This is a problem with all electric cars, not just Porsches. It’s a much bigger problem, arguably, than battery range. But it magnifies that problem. Electric cars can’t go as far as gas-engined cars, even very thirsty ones. A 911 Turbo averages about 20 MPG (19 city, 24 highway) but it can still go between 340 and 429 miles (city/highway) on a full tank – which is at least 100-150 miles farther than the longest-legged electric car currently on the market, a Tesla S.
And the range touted by Tesla and other EV advocates should always be taken with two big spoonfuls of salt – because it’s much more variable than the range of a gas-engined car. For example, electric cars are more affected by heat – and cold – in part because power-using accessories such as AC and heat are powered by electricity and take a lot of electricity to power. Use these accessories and your range decreases. Electric batteries also lose efficiency in extremely cold weather – just like the 12V battery that starts a gas-engined car. But once a gas-engined car is running, cold weather doesn’t affect its range – even if the heat is used – because the heat is created as a byproduct of the running engine . But even if an electric car’s range exactly matched its gas-engined equivalent, there is still the problem of recharging these things. It is a time problem. And “fast” chargers aren’t going to solve it – because they’re not. Not unless people can be sold on the idea that a minimum 30-45 minute pit stop for a partialrecharge is “fast.” That’s the fastest you can recharge – and only partially – at a “fast” charger, because that’s the amount of time required by physics and chemistry to safely put a partial charge back into an electric car’s battery pack. Most EVs have lithium ion or nickel metal hydride batteries – as opposed to lead acid – but the principle behind the time needed to safely recharge them is the same as it is for any other battery, including the 12V batteries we use to start our non-electric cars and for that matter, the 18V batteries used in our cordless power tools. An electric car’s battery pack isn’t just an empty container into which electricity can be pumped. When you plug in, electricity is metered into the battery’s cells, where chemical reactions take place that cannot be rushed without risking permanent and expensive damage to the battery pack. 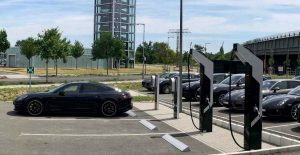 This is why it takes 30-45 minutes or longer to “fast” charge an electric car – and it’s also why electric car batteries can’t be fully recharged at “fast” chargers. Just like the 12V battery in your car and the batteries that power cordless tools, fully recharging requires slow charging. Several hours, at least. Gas, on the other hand, is liquid power. It is portable and immediately transferrable. When you fill your gas tank, you’re not re-charging it. You are merely re-filling an empty container. This can be done in about five minutes. Not partially, either. It is very difficult to visualize more than a small percentage of the driving public willingly giving up the convenience of being able to fully refuel their vehicle in about 5 minutes in exchange for an electric car that takes 30-45 minutes to partially recharge. 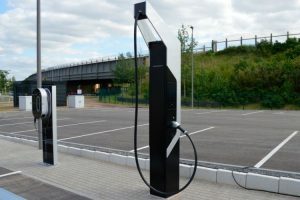 And which requires recharging more often than a gas-engined car needs to be refueled – because it can only be partially recharged at these “fast” chargers – which multiplies the inconvenience. Yes, it can be done at home – or at your Porsche store. Or anywhere else there are “fast” chargers available. But you’ll still have to wait those 30-45 minutes, unless a way is found to end-run physics and chemistry. And you’ll probably be doing it several times a week, too – vs. once a week to refuel your gas-engined car. 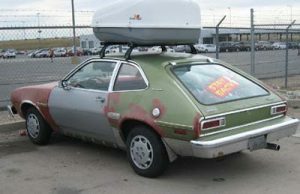 Road trips will take longer; everything will take longer. Pity the marketing and sales people whose job it will be to sell this to the public as progress. Their job will be not unlike trying to convince people that flying from New York to LA in a piston-engined DC3 over the course of 18 hours – with a couple or three stops along the way – is preferable to hopping on a 757 for a non-stop four-hour flight. Oh, and there’s the surtax for these “fast” chargers. 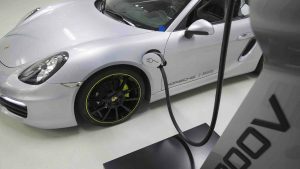 The Porsche stores – which like most dealerships are independently owned franchises – aren’t going to just absorb the $300,000-$400,000 it will cost them to post these “fast” chargers at their stores. 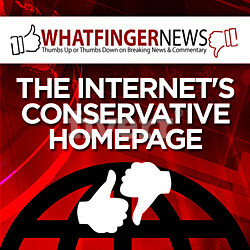 They will fold the cost into what they charge customers – and the same is going to happen generally. For this electric car thing to even conceivably operate on a mass scale, “fast” chargers will need to become at least as common as gas stations are now. More common, actually – because more “fast” chargers will be needed because it takes so much more time to “fast” charge an electric car. A single gas pump can fully refuel nine cars in 45 minutes. 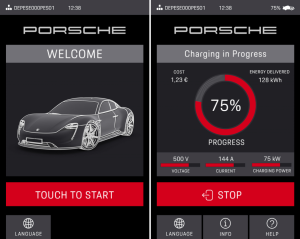 A “fast” charger can partially recharge one car in the same time. Put another way, it will take nine “fast” chargers to do the job of one gas pump – and then only partially. This will get into money as well as time. 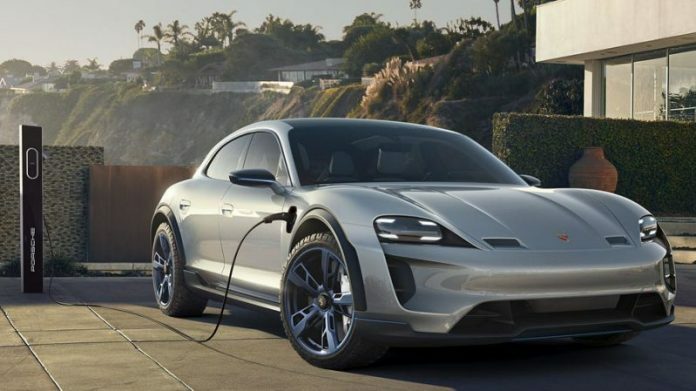 Either it will have to be folded into the price of the electric car itself – as Porsche seems bent on doing. Or it will be done via new taxes on electricity or miles driven or some other mechanism. These taxes will probably make current motor fuels taxes seem like chump change, given we are talking not merely about erecting an entirely new infrastructure system on a national scale but one that will have to have a much larger footprint than the current infrastructure for gassing up cars. Where will the physical space come from for all these “fast” chargers? Where will the additional capacity come from to power them all? We know one thing. It will come out of our pockets to pay for it all.